I am going to share with you my absolute favorite high protein satisfying breakfast. It might seem a little odd, but don't knock it 'till you try it! If you already have the beef patty on hand, this recipe takes less than 5 minutes! 1. Add 1/2 cup of water and the oats in a microwave safe bowl. Set for 90 seconds for instant oats, or 3 minutes for old fashioned oats. 2. 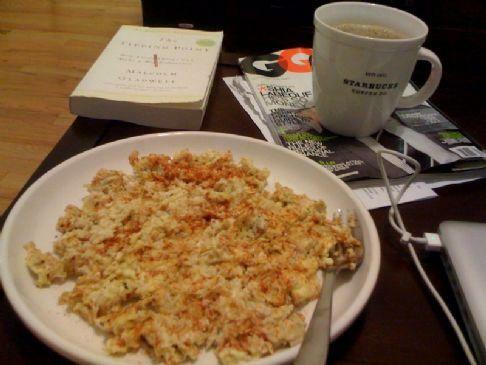 Add the beef or turkey crumbles, then crack an egg and drop into the oatmeal. 3. Microwave for an additional 1-2 minutes depending how hard you want the egg to cook. 4. Sprinkle with a bit of sea salt, stir and eat! Serve with fruit or a glass of v8 or OJ for a complete breakfast.